In case you’re not familiar, this 1990 film, tells the story of Edward, a man-made man who was unfortunately unfinished at the time of the inventor’s death. He had a head, a heart and a soul but he had no hands. In their place, he had scissors. Having scissors for hands and no interaction with anyone for an undetermined amount of years left Edward detached from society and, without the reassuring touch of another human being, he felt incapable of connecting. He lived in peace, albeit lonesome, atop a hill in a mansion that overlooked this quaint suburban Burbank neighborhood, until one day, when none other than Peg, the Avon lady, knocked on his door. When Peg (Dianne Wiest) saw that Edward (Johnny Depp) needed so much more than cosmetics, she decided to take him home with her. What she didn’t anticipate was how a supposedly normal society would react to such a supposed freak. 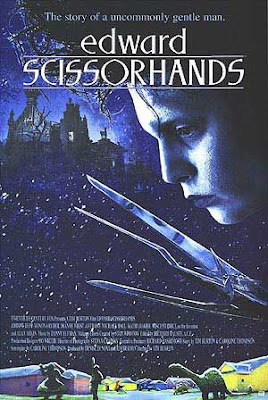 Burton considers EDWARD SCISSORHANDS to be one of his most personal works and, when you consider it to be the birthplace of so many recurring Burton themes and motifs, it is easy to see why. Burton himself grew up in Burbank and, although I cannot personally attest to his accuracy in recreating it, I can certainly feel what it must have been like for such a unique artist to have grown up in this type of environment. Edward, with his pale skin, unkempt black hair and, well, scissors for hands, is at first the object of total fascination in this community that consists of cookie-cutter houses that vary in pastel exteriors. Inside these houses are men who all leave for work at the same every day and their wives, the originally desperate ones, who need the drama of the neighborhood to give their lives meaning. With everyone playing house, there is no room for different and no reference as to how to deal with it. 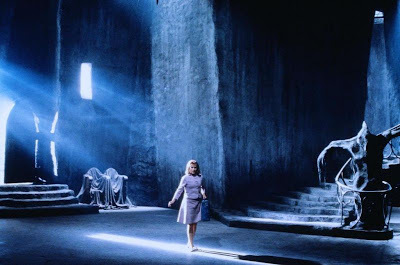 Being the outsider, being misunderstood, being dark and having people wrongly equate that with evil – these are all themes that Burton is obsessed with and certainly also themes that spring directly from his own experiences with society. EDWARD SCISSORHANDS allows him to put himself out there and allows the viewer to see what he presumes to be how a wider audience will react to him. And so, his expectation is that they will embrace and admire his differences at first but eventually come to revile him for them. A burst of excitement is all these rutted people crave but they learn quickly that they prefer the comfort that ruts also often offer. Of course, Burton’s onscreen representation is exaggerated by Depp. At this stage in his career, Depp was seen as merely a teen idol, which was not meshing with how he wanted to be seen or where he wanted his career to go. With his sweet face covered in makeup and scars, Depp was able to show audiences his Keaton-esque side – his humour, his empathy and his charm. At one point, Edward is on a daytime talk show and one of the audience members asks him if he would have his scissors replaced by hands if that were possible. Edward doesn’t hesitate and says, “Yes.” But then, the lady in the audience points out, he would be just like everyone else, that there would be nothing special about him. This is where this unexpected Burton-esque optimism fills the screen. Peg, sitting next to Edward, says that he will always be special. In that moment, we are all Edward. We all have something unique about us that, if we cannot hide, ostracizes us from everyone else. When you live your life removed from everyone, you do not know the healing qualities of human touch. And when no one has touched you in a long time, you can lose the confidence to reach out and touch someone else. You may even think that you are not even capable of it. Behind the scissors that keep everyone at a distance, Edward is just a man and, like any man with a sensitive heart, he simply wants to love. And what could be more lovely than the image of a young Winona Ryder spinning freely underneath the snow-like shavings of an ice sculpture that Edward is carving just for her? 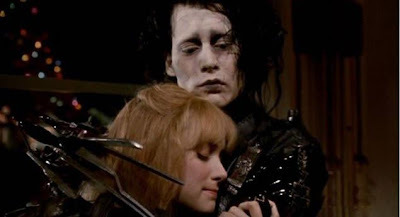 With EDWARD SCISSORHANDS, Burton shares this wonderful gift with his Edward, with his audience and with himself. Suddenly, the Burbank boy that always felt different knows what its like to touch the hearts of others. Great review. This is another one of the films that I remember watching when I was younger and not quite understanding, but when I watch it now I get pretty emotional. On another note, I also have a mancrush on Johnny Depp. If you’re going to have a mancrush, I think Depp is a pretty good place to settle in.